Although relatively characterless, these Crisps were not so thinly cut that they mushed up to a pulp instantly. There was a reasonable thickness to them and the mulchy stage at the start stayed with us for a sufficient period before swallowing. These Crisps featured a relatively smooth surface in comparison to most Crisps. Well, not smooth, they were bumpy all over, but there were literally no oil blisters or boils at all. They were also relatively flat. No bends or gnarls. There was however some coloured seasoned here and there. First off, it should be said that the Chimichurri flavouring overwhelmed whatever beefy Steak like flavour that may have existed. Then, it should be added that Chimichurrir itself is a rather subjective flavour, with many different recipes and versions. 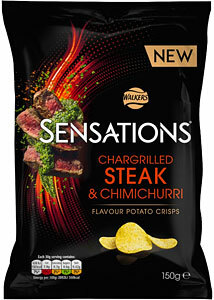 Finally, it should be said that the overwhelming plasticky flavour did not go down very well at Chips and Crisps. However, that does not overcome the overall performance. They say they are a particular flavour and that is [mostly] what they were.